Rosehaven Cottage: Secrets Within My "Secret Garden"
There are nooks and crannies everywhere throughout the front garden that hide little pretties here and there. I love taking a slow stroll through the garden and spying new discoveries that are growing on their own--most without any intention on my part. The square green pot on the front porch right next to the red front door is one of those spots. It seems that it is a favorite place for volunteers to pop up. Earlier this spring it was the site of my volunteer sweet peas and then some blue lobelia spilled forth on the backside of the pot in late spring. 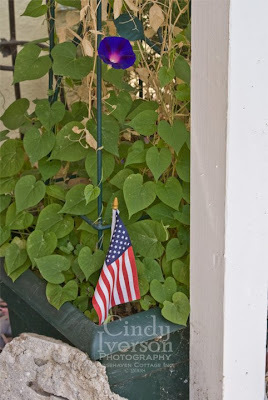 Now there is a lovely crop of morning glory vines with their heart-shaped leaves and deep blue blossoms. This dark variety of morning glory is called Grandpa Ott. Last summer, I received some plants from my dear friend who's a horticultural guru and instructor at our local college. After enjoying them immensely, I let them go to seed at the end of the season last fall, letting them wither and dry up. Then I popped some of the seeds out and poked them into the soil of the pot sometime in January. I didn't know if they'd sprout or not. Looks like they did! This year's flowers have stayed true in color to last year's "parents". The blue is so dark and deep I feel like I could fall into it. I just love it! It speaks to my passion for blue flowers. What's really neat about this batch is that the vines don't send out their blossoms all at once. It's like each flower gets its own turn to have a show before the next comes on stage. Because the pot is right next to the door, I can keep a really good eye on what's trying to surprise me there. But there are so many other spots in the garden that aren't like that. I have to get really "up close and personal" in order to see some of the secrets hidden elsewhere. And sometimes things are hidden in plain view. Just take a look at this. I'm assuming it's a lily. I don't remember planting it. I've never had it before in the garden, nor have I ever seen it before EVER. Is it a spider lily? I almost missed this completely because it's growing in the midst of some bunches of blue fescue grass that camouflages it expertly. Even photographing it was a bit difficult. But I had to post it so I could get some idea of what it is. Talk about a surprise. About 3 feet away is another set of shoots with thick waxy leaves coming up that look very similar to this one's leaves. I'm wondering if I'm going to get a two-fer surprise. Wouldn't that be neat?!?! That deep blue morning glory is gorgeous. I've never seen one that deep of a blue before. I don't know what that white flower is either, but what a nice surprise in your secret garden. That truly is a deep blue -- I've never seen one of that color before either. Gorgeous! The blue color is amazing! I love the morning glory as sumptuous colour. I think the white bulb is the Peruvian daffodil (Hymenocallis x festalis). I was give one bulb as a present (they are quite expensive here) but as it is half-hardy I will need to protect it for the winter but I have the feeling it might be a one-year-wonder - if it flowers! I love morning glory. Have you tried the red one "Scarlet o'Hara"? Totally gorgeous! My fav is in shades of purple as it's my fav colour. On Rhodes there was a tennis court fence just colvered in the purple one. At night they would shut but in the sun the whole 10ft fence would be covered in purple. Stunning plant! Beautiful front garden by the way- looks like the same size as mine, but a previous owner planted half of it in conifers. I do prefer the cottage style you have. Beautiful! How about this... I vote for *frilly-lily*. Love this post. The white flower is a peruvian daffodil. I planted a few from bulbs at my previous house. Not all the bulbs came up they only lasted a year.They were very exotic looking. What a lovely surprise to greet you in your garden. I saw a lily like yours on another blog a few days ago. 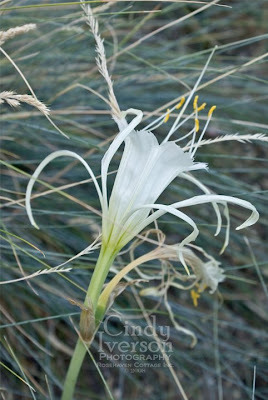 Hymenocallis latifolia. You can google and see if it's the same. Love your morning glory. I had one like it sever summers ago. When I mulched the bed heavily in the fall, the seeds did not come up. I will have to resow next spring. Have to "me-too" here: your morning glory is indeed glorious. That would be a joy to see every day. 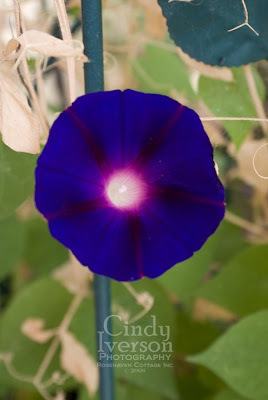 I love blue flowers too - but that morning glory is, indeed, glorious!